It’s the time of year to knit tons of little warm things. I don’t mean to. I want to finish the Treeline Striped Cardigan (getting there), I want to rip out that shoulder and try a new one on the Tomten, I want to start Mr. HelloYarn’s cardigan. I need to pose for photos in my Cobblestone, for the love of kittens. Instead, I spin single skeins of yarn, dig around for yarn for mittens and lay all the colors out to admire them on the coffee table, and knit things that take 2 evenings, tops. The past few days, it’s been legwarmers. No pattern, they were knit like these, to measure. This pair is 15″ long and took 4.6 oz. of handspun bulky weight 2 ply yarn. 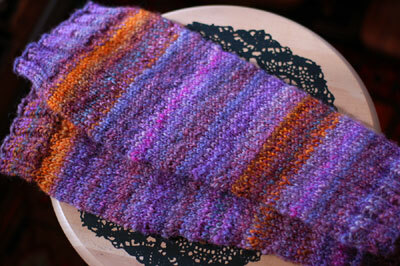 I didn’t measure the yardage (too excited to start knitting), but I’m thinking less than 250. They were spun from a mix of Mandarin Corriedale wool and Sugar Lips BFL wool. You have to love those little leftover bits from the dyelots for the shop. Lady, this is when I think your a genius. I could not have imagined the two colorways together. They look toasty warm! Happy B-day to Shambles and Happy Thanksgiving to you! I really don’t blame you Adrian, it seems like all I want to knit are small warm things too! I should be working on a Christmas sweater, and instead I just cast on for a hat. Happiest of Happy Birthdays to the Capt.! Happy Birthday, Shambles! Awesome legwarmers–What happy colors! Ooooo, beautiful! 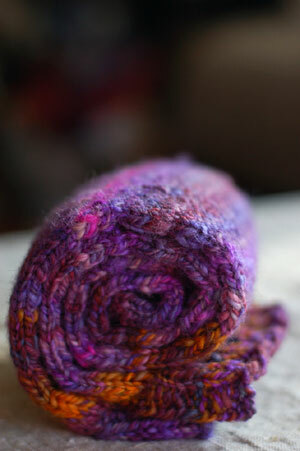 I love the colours – so warm and pretty. happy birthday wishes to sweet mr. shambles!!! those look so toasty and cozy – perfect for this rapid decrease in temperature we’ve been having! Happy Birthday Mr. Shambles! He looks amazing for 16!!! happy birthday shambles!!! now you can get your learner’s permit! How cute is Shambles?! 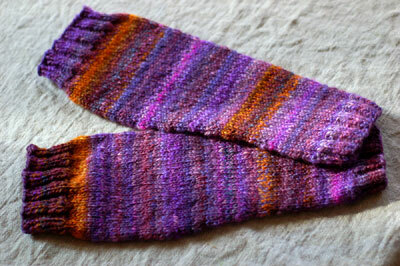 Those legwarmers turned out swell – love the orangy bits. Happy birthday, sweet Shambles! I love the legwarmers. Just looking at those beautiful colors warms me up. Happy Birthday, Shambles! You’re such a cutie-patootie! Happy Birthday, Shambles! By the way, he has the best dog name ever. Seriously cute, without being cutesy. And, yeah woman! Show us your Cobblestone! Love the legwarmers. The pop of orange makes my day! Wow, 16! Happy Birthday to Shambles. We just figured out that my calculations were wrong and Ellie is 7 years old (has been with us for 6). So she is a baby. And speaking of babies, what a cutie in that awesome outfit. It’s too much knitting to actually wear at once, unless you’re a baby. And it’s all gorgeous. I know he probably doesn’t remmeber me but tell Shambles I said happy birthday.